Quick, easy, on time, and friendly. Thanks! Friendly ! Competent ! Great job! Had a terrific first experience. Will absolutely be using Mr. Rooter for my plumbing needs in the future. Wonderful customer service as always! The technician was very knowledgeable. The technician installed our new water heater with care. Professionalism and a good knowledge of the work being performed. 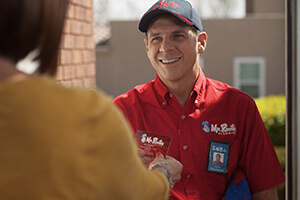 I am always satisfied with the work competed in my home by Mr Rooter services.